On the 6th of June 2014 the first ever Daho.am Developer Conference was hosted by STYLIGHT. Six inspiring talks from speakers across the world and a lot of very Bavarian food brought together 200 developers, IT experts and CTOs from all over Munich, Germany and the world. ..and then there was me, a freshly started fashion-affinate event management intern at STYLIGHT. At a first glance the topic under which the conference took place was rather far from what I am dealing with on a daily- basis, still my main aim as an event manager was to ensure the conference run to as smooth as possible and to create an atmosphere that is as enjoyable as possible. Let me give you a little recap about a day full of coding language, developers jokes, Bavarian food, inspiring talks and a lot of interesting people. 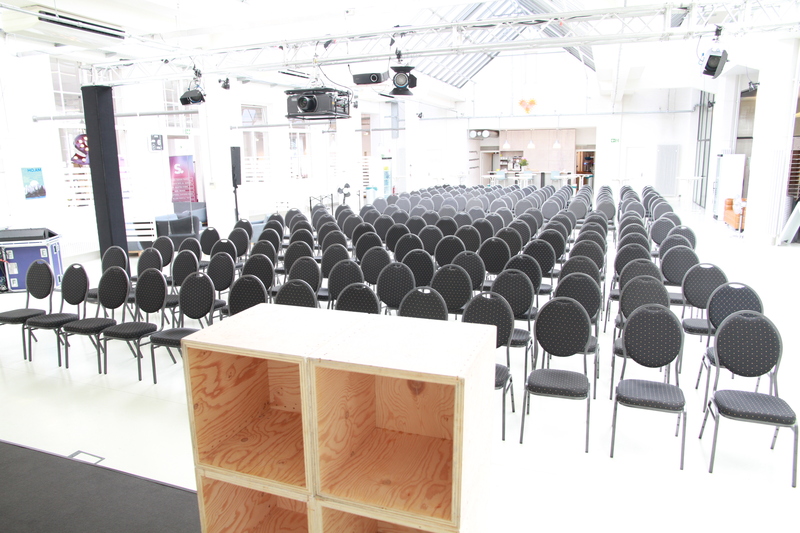 Overnight STYLIGHT’s Headquarter transformed to a fully grown conference venue. With the set-up of 200 chairs, 10 bar tables, two buffet, 2 fridges, a stage, a projector and a monitoring desk turned the atrium (the heart of our office) into a place which was hardly identifiable anymore. To top this all off, the outside area of the office was turned into a small beer garden – to keep it all very bavarian of course. When the doors opened at 11 am and the last preparations were finished right on time, the first guests already lined up to get their traditionally Bavarian Weißwurstfrühstück. The catering service brought to us, what for every true Bavarian is indispensable for breakfast: Brezn, Weißwurst, sweet mustard and most important: beer! And as it was over 30° C outside the small “beer garden” we built in the parking lot topped the Bavarian feeling off. With over 200 guests having signed up for the conference, the tickets were fully sold out already one week prior the event. Not only the big run on the tickets accordingly increased the aspiration I, as an event manager, had to the event, but also the number of high-class speakers we invited was truly incentive (and maybe a little bit intimidating). If there are names to be dropped in the world of developers: we had them. The first things you came up with right now were Google and Facebook? Guess what? We had developers from Google AND Facebook speaking on our conference. At 12 am Sebastian Schuon and Anselm Bauer, CTOs of STYLIGHT, gave the official kick off to the event and by no later than the introduction of Amjad Masad, software developer at Facebook and first speaker of the conference, they definitely had all the attention of the whole audience. My academic background made it a little hard for me to get the numerous jokes he made during his speech about “Product Refactoring” , however, the reaction of the audience was more than proof to me that he not only is a great speaker with a lot of sense of humour, but also gave a lot of inspiration to his listeners. The following talk of Lars Jankowsky, serial entrepreneur (OXID eSales, Swoodoo, yatewgo etc. ), about “Company Refactoring” and his extraordinary speaker’s skills even topped off the enthusiasm of the audience. The atmosphere was great: one could hear people laugh, others clap, keyboards clatter, while and nodding heads all along the rows. But of course there was one big aspect which was expected to be pleased. Next to providing inspiring content, bringing together experts and of course providing plenty of food in between all breaks, one of the main aims of a conference is to provide the possibility for networking. To ensure an as satisfactory networking experience as possible, we provided a name tag (of course including the name, position and company) for everyone checking in at our counter. Truth be told and learning be noted: the name tags should have been both-sided, as no one is keen on asking their counterpart to turn their name tag around to be able to see the name. Nevertheless by no later than in the first break at around 2 pm, the first two speeches definitely lead to a sufficient amount of topics for conversation. Meaning: Let the networking begin! The first break, which was of course counteracted by some food in form of fruit baskets mainly took place outside in our “beer garden” again and gave me and my helpers time to refill our fridges with soft drinks, water and guess what? Beer! By the way here we have another very organizational learning to be noted: more fridges are needed! My dedicated helpers spent most of the time refilling the fridges to please the thirsty throats of the conference’ guests, which unfortunately is connected to some kind of noise and a lot of dragging. Coming back from a refreshing “beer garden-fruit-break” the audience was very keen on hearing what Jesper Richter-Reichhelm, head of engineering at Wooga, had to say. His talk about “Devop goes mobile” was not less entertaining and informative – at least the crowd’s reaction proved me so. I have to admit that the following talk of Sebastian Schuon, CTO of STYLGHT about “Scaling for an International Product” was the one easiest for me to follow. There was less coding language and a lot more of STYLIGHT’s story of going international to be noted. Sebastian gave a great insight on the developers point of view to this story. His and the following talks on “Product Management & Engineering” by Patrick Nepper, Product Manager at Google and on “Get rich or die trying” by Lars Jankowsky lead to some critical voices we evaluated from our follow-up survey. “For a ‘developer’ conference it was not sooo much about development and for my taste too much about entrepreneurship.” So, there definitely is another learning to be noted: Either name the conference differently or put more focus on the development topics. However, as the reaction of the audience to Patrick Neppers’s talk spoke a not at all critical language and the number of questions asked during the Q&A after Lars Jankowsky’s “Get rich or die tryin” talk went beyond all our expectations, I would rather go for renaming the conference than miss out on any of the talks! The last talk was a great round up for a very international, but still also Bavarian developers conference.With a very traditional Bavarian diner, a day full of coding language, entrepreneur stories and great conversations found its end in a get together in the office. Summing up it must be said my biggest learning definitely was to realize that planning an event which content-wise is very new for me is not necessarily a hurdle – it rather was a great challenge and a wonderful way to meet numerous interesting people. Further DAHO.AM also proved me in my theory of the 3 things which every event manager needs: the ability to keep level head when things go wrong, a stomach for seriously hard work and most important: comfortable shoes. I had all three of them and to top all that: I had a lot of fun.